A portion of State Highway 43 was dedicated to Ricky Barraza, a fallen soldier from the Shafter community. 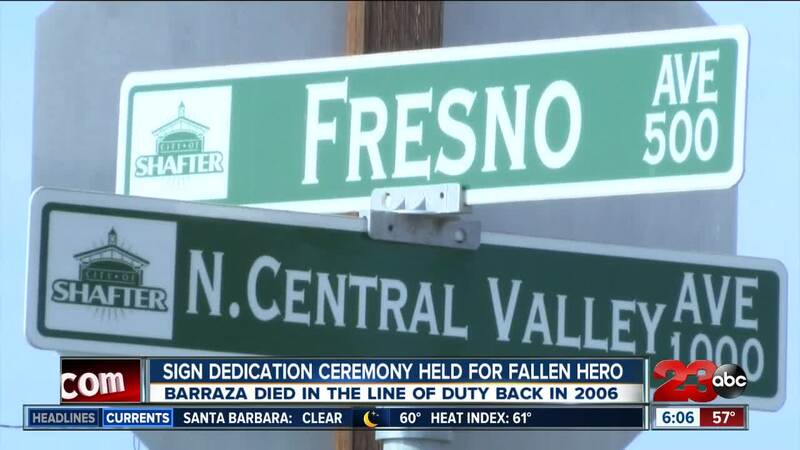 A portion of State Highway 43 was dedicated to Ricky Barraza, a fallen hero from the Shafter community. BAKERSFIELD, CA. — Ricky Barraza died in the line of duty on his third and final tour in Iraq in 2006. He grew up in Shafter and his community continues to honor him today. This morning, a portion of State Highway 43 at Fresno St. was dedicated to the fallen hero. The community gathered by the brand new sign for a dedication ceremony led by Assemblymen Rudy Salas, who supported the bill for this project. The sign resides down the street from Barraza's childhood home. According to his mom, he would have never believed something would be dedicated to him because he was a humble man. "This is the best present I could have.. There's nothing better than this," said Nina Barraza. "Every time I go to work I'm going to see my son's name and that's awesome." A local Air Force veteran from the Wasco community initiated the idea for this project. "I learned about him and I was pretty shocked that Shafter had nothing in the city to memorialize him since he made the ultimate sacrifice," said Mariana Soborewski, Air Force Veteran. According to Soborewski, the project was funded by donations from local farmers and businesses. Funds also came from last year's marathon dedicated to Barraza. Soborewski says they will hold another marathon in March 2019 near the date of his passing anniversary.